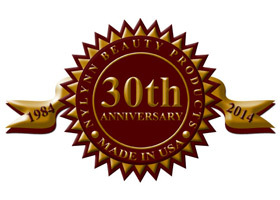 Nylynn Cosmetics Inc. was founded by Gregg and Deidra Gochneaur in September 1984. The Gochneaur family is no newcomer to the cosmetic industry. Their father V.G. Gochneaur was the founder of the very successful cosmetic company Fashion Two Twenty in 1962. That comprises over 36 years of manufacturing and sales expertise to the cosmetic industry by the Gochneaur family. Nylynn Cosmetics is the professional product for the professional person of today, therefore our products are sold exclusively by licensed Cosmetologist, Estheticians, Dermatologist and Plastic Surgeons. Deidra Nylynn Gochneaur for who Nylynn Cosmetics is named after is the artistic force behind the company. With a bachelor of Fine Arts degree in commercial art, Deidra uses this to serve as a teaching platform for the techniques of glamour application. Being a Paramedical Esthetician and Cosmetologist serves to bring the professional background to our company. Deidra is at the very top of our industry, specializing in the latest techniques in skin care treatments, fruit and lactic acids, light to medium skin peels, products and services. She has worked on many famous faces and on the popular T.V. series “Dallas”. Deidra is a platform artist in the professional beauty industry and is known as the “Classic Image Maker”. She is a easy going lady that brings a dedication to the educational aspect of the beauty industry. She believes in sharing and caring. She is respected, renowned and revered by her peers throughout the world. She is well known for her work with Cosmetologist, Dermatologist and Plastic Surgeons. The creation of the Nylynn product line came about when Deidra developed a blood disorder with a side effect of cystic acne. Antibiotics were not an option so therefore the necessity arose for her to develop products to clear up her skin from the dermis to the epidermis. Nylynn’s products are formulated to be water based, hypo-allergenic, allergy free, fragrance free and cruelty to animals free. It is through the combination of extensive background, strong leadership and superior products that Nylynn Cosmetics Inc. is the fastest growing cosmetic company in the professional beauty industry.